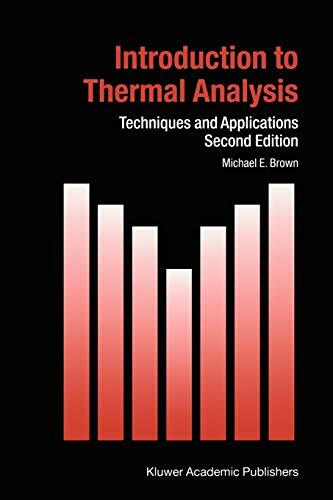 [PDF] Introduction to Thermal Analysis: Techniques and Applications (Hot Topics in Thermal Analysis and Calorimetry) | Free eBooks Download - EBOOKEE! Description: Thermal Analysis is a well-established set of techniques for obtaining qualitative and quantitative information about the effects of various heat treatments on materials of all kinds, including new chemical compounds, plastics, ceramics, alloys, construction materials, minerals, foods and medicines. Heating is performed under strictly controlled conditions and can reveal changes in structure and other important properties of the material being studied. Such studies are of great practical importance in the use of materials.This new edition has been thoroughly revised and rewritten to account for the changes that have occurred in the techniques and the instrumentation since the original edition in 1988. These changes include the introduction of new modulated temperature techniques and the exciting world of micro thermal analysis, based on novel adaptations of atomic force microscopy. These new techniques are integrated with the older standard techniques.The aim of the original edition has, however, been retained and is to provide a brief, readable introduction to these versatile techniques, for anyone contemplating their use, from which it is possible to move on to the specialist literature. No comments for "[PDF] Introduction to Thermal Analysis: Techniques and Applications (Hot Topics in Thermal Analysis and Calorimetry)".